G. Love & Special Sauce is an alternative, blues, hip hop band from Philadelphia. They are known for their unique, “sloppy”, and “laid back” blues sound that encompasses classic R&B. 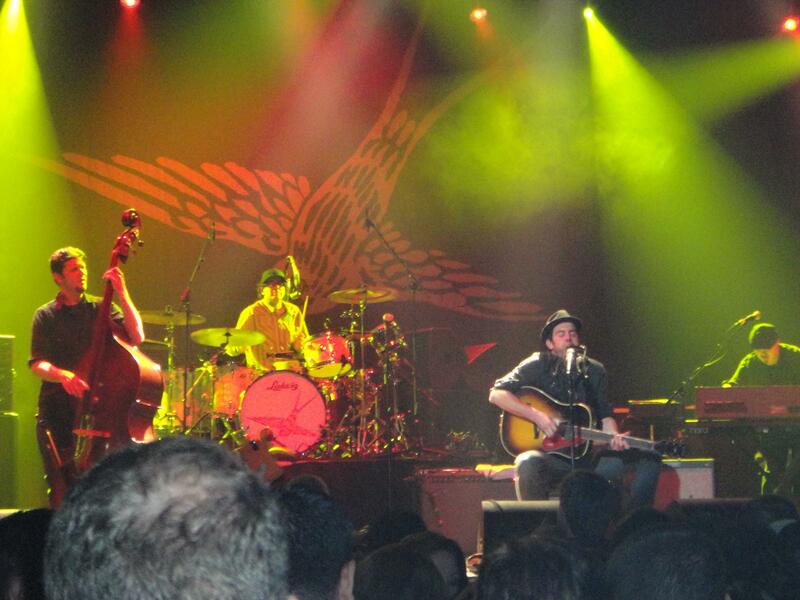 G. Love (Garrett Dutton) plays several different guitars during a set including one with a “G” engraved in the wood. He also plays the harmonica to add that blues feel into his songs. ﻿﻿﻿﻿﻿﻿﻿﻿You can tell G. Love loves to perform and has fun while doing it! He always does some impromptu free-styling during his set and invites crowd participation. Since this is March Madness, he decided to rap about basketball and then even mention Dirk Nowitzki – being in Dallas, it was like a little shout out to the city he was performing in. The crowd seemed to enjoy the personal touch. G. Love is the one show I look forward to every year! I guess you can say he is a guilty pleasure of mine… I see him at least once a year – although one year, I saw him three times in one weekend!!! Well, I must say that G. Love didn’t have the best timing this year… He usually plays Dallas in February (I know this because I usually go with my cousin for her birthday), but this year he played the front end of SXSW and came to Dallas after. Even for a Saturday night, I feel that the audience was a bit different from the usual Dallas G. Love crowd. This was a great weekend to be in Austin with all the great line-ups. I think that a lot of Dallasites went to Austin and left the House of Blues somewhat empty. The thing about the House of Blues, is that to go to a show there, it costs an arm and a leg… I know it is a good venue in the long run, there are plenty of them across the nation and the sound is good, but damn, it gets expensive! The tickets for shows are usually over $20 (well worth the full two hours of main attraction of music being played and then bonus band opening act). Then there is parking – your two choices are either $5 across the street under the highway or $10-$15 valet (which takes forever!) Then there are drinks ($9 for a domestic tallboy that you can buy for $2 at the gas station). Just being realistic. It seemed to me that there might have been a bunch of newbies at this show. Usually, G. Love asks for participation of the crowd and I didn’t hear the mass of people responding. It’s like the crowd didn’t know the songs being played. Yes, he played a few songs from his new album “Fixin’ To Die” that was just released at the beginning of this month, but the favorites still were not as full in participation that I am used to hearing at these shows. His new songs are toe tapping and catchy, just as his old songs. It is easy to get lost in the moment of the song, especially as he and his band “Special Sauce” jams out. I look forward to the next time to see G. Love and Special Sauce – even if it will be at the HOB. The Apache Relay was the opening band from Nashville, Tennessee. So, of course there is a fiddle player… They are a folk/indie rock group that really feeds from the audience. They got the audience to start dancing and had a great turn out at the merch booth after they played, I think they made some new fans from Dallas! As G. Love played they were out in the crowd enjoying the show with the rest of us until G. Love invited them to come and play a few songs including Paul Simon’s “Fifty ways to leave your Lover” as a finale. They are some really talented and nice guys. These guys have earned some cred, by just recently having a secret show with Mumford & Sons last month. The Apache Relay got put on tour with G. Love for five shows because they played that show with Mumford and Sons, who played the Grammy’s with the Avett Brothers, who produced G. Love’s new album “Fixin’ To Die” in a church-turned-studio in Ashville, NC. And there you have it! This entry was posted on Sunday, March 20th, 2011 at 10:33 pm	and is filed under Music. You can follow any responses to this entry through the RSS 2.0 feed. You can skip to the end and leave a response. Pinging is currently not allowed. « Director D.J. Caruso Talks “Preacher” Movie And Some Actors Are Already Interested!! !